This extended paper was presented in the Geometry Topic Study Group at the 13th International Congress on Mathematics Education in Hamburg, Germany in July 2016. A longer and more wide-ranging version will be included in the proceedings volume, available in 2017. 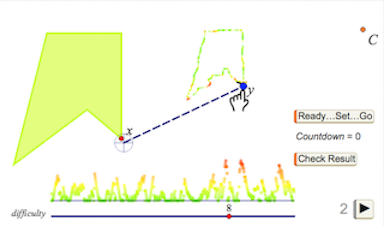 This paper describes an approach to learning function concepts that uses innovative technology to engage students in constructing and manipulating functions—in the form of geometric transformations on the plane—and extending these sensorimotor experiences to help them make sense of linear functions and their Cartesian graphs. This paper supports the authors’ presentation in the ICME-13 Topic Study Group 13 on Secondary Geometry. An extended version will be published in the Conference Proceedings, but this online paper has an added feature: Most of the figures are interactive, allowing you, dear reader, to experiment with the constructions yourself. 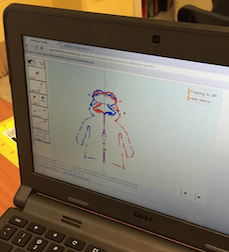 Each interactive figure includes a ‘Try it yourself’ button that you can use to show or hide the corresponding interactive websketch. The interactive websketches are accompanied by directions for use and by a link to the full activity, and the websketches with tools have a button for showing construction tips and links to short videos illustrating tool use. Tap any section title below to show or hide the contents of that section. Please contact the webmaster for detailed information on Web Sketchpad. How does it feel to move like a dependent variable? Most students would regard this question as nonsense; they view variables as abstract ideas with no connection to their sensorimotor systems. Though developing students’ understanding of function concepts is a critical goal of secondary mathematics, few students graduate from secondary school possessing a robust conceptualization of function. (Carlson & Oehrtman, 2005) Students have little sense of covariation, their concept image of function is at odds with the formal definition (Vinner & Dreyfus, 1989), and they graph functions without fully understanding the link between the variables and the shape of graph. Mathematics educators have long stressed the importance of learning by doing, and cognitive scientists research ways in which “cognitive structures emerge from the recurrent sensorimotor patterns that enable action to be perceptually guided.” (Varela et al., 1991, p. 173) Yet our curricula fail to provide students with sensorimotor grounding for function concepts. The primary visual representation that students encounter is the Cartesian graph, which lacks any explicit representation of variables; the other main representation is an equation, such as f(x) = 2x − 3, that lacks any sense of dynamism, any opportunity for students to put variables into motion. Not surprisingly, students’ difficulties with functions often begin with the concept of variable, which has so many meanings and serves so many purposes that students have difficulty formulating a coherent sense of the term (Schoenfeld & Arcavi, 1998). Freudenthal (1986, p. 494) argues that mathematical variables “are [an] indispensable link with the physical, social, and mental variables,” and observes with approval that “originally ‘variable’ meant something that really varies.” (1986, p. 491) But students seldom experience variables in motion. If the learning of function begins not with static graphs and equations but rather with variables in motion, with the dance in which independent and dependent variables engage, we argue that students will be able to develop a more detailed and robust concept image of function, and that ideas like relative rate of change, domain, range, composition, and inverse will be better grounded in their sensorimotor experiences. We believe that with such a concept image as a foundation, students can more easily learn to look at a Cartesian graph and visualize the implicit motion of the variables, mentally seeing x move along the horizontal axis while f(x) moves in synchrony along the vertical axis, and that students can even learn to look at an equation like f(x) = 2x – 3 and visualize x in motion, with its dependent variable also in motion, scaled by a factor of 2 and then reduced by 3. Though geometric transformations are functions that have as their variables points in the plane, transformations have seldom been used to introduce function concepts. (An exception is Coxford and Usiskin’s groundbreaking 1971 text Geometry: A Transformation Approach.) Yet Freudenthal has observed that “Geometry is one of the best opportunities that exists to learn how to mathematize reality…. [N]umbers are also a realm open to investigation…but discoveries made by one’s own eyes and hands are more convincing and surprising” (1973, p. 407). In this paper we propose leveraging geometric transformations, supported by dynamic geometry software, to enable students to construct and experience functions in a compelling, memorable way. (We call this approach geometric functions.) Technologically, we use Web Sketchpad software that runs on any modern browser and provides a simplified interface based on tools chosen and customized for each activity. Use the first three tools to construct independent variable x and reflect it across a mirror. Observe the behavior of dependent variable rj(x), and turn on tracing to make an interesting pattern. What is the relative speed of the variables? What is their relative direction? Where can you drag x? As you drag x, where can you make rj(x) go? In the course of this and other related activities, students are encouraged to use the functions they are creating and investigating in order to produce interesting images as in figure 2. We use a design-based research methodology to iteratively develop, test, and refine the activities described here. (The Design-Based Research Collective, 2003; Barab & Squire, 2004; Fishman et al., 2004) Although earlier versions of some of these activities were developed with the support of the Dynamic Number project funded by the National Science Foundation (Steketee & Scher, 2011), development of the current activities began in earnest in late 2014, when customizable tools became available in Web Sketchpad. We have currently developed 14 activities organized into two units: Introducing Geometric Transformations as Functions (Unit 1) and Connecting Algebra and Geometry Through Functions (Unit 2). To date we have conducted pilot tests with four classes (two at 8th grade and two at 10th grade) located in inner-city Philadelphia schools. (Though designed as an introduction to linear functions, these units appear to be effective even with students who’ve already studied linear functions.) These pilot tests have resulted in substantial changes to the original websketches and student worksheets, and have informed the creation of performance-based assessment instruments both as stand-alone websketches and as pages incorporated into the main activity websketches. We describe below several of the activities, emphasizing how technology-enabled guided inquiry tasks have enabled students to enact mathematical objects and concepts related to function. We also note several instances in which our pilot testing of the activities has revealed weaknesses in our original instructional design, prompting rethinking and revision of that design. The act of dragging geometric function variables can help students develop the sense that variables really do vary. In figure 1 (above) the student constructed and dragged independent variable point x, thus enacting the independent variable. In figure 3 (part of the Rotate Family activity) she has made a Hit the Target game. 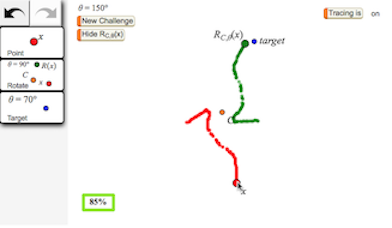 After constructing independent variable x and a rotate function to produce dependent variable RC,θ(x) (the “rotation, about C by angle θ, of x”), she then used the Target tool to make a target and create a challenge: drag x so that dependent variable RC,θ(x) hits the target. 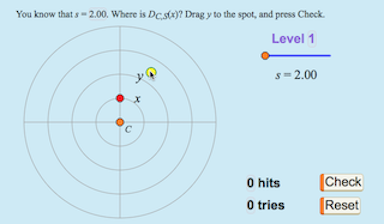 Once the game-player hits the target, she can generate a new problem by pressing the New Challenge button, which changes both the rotation angle θ and the location of the target. Rotate x and position all three glowing objects to construct dependent variable RC,θ(x). Construct a target, matching glowing point C to the existing center of rotation. After some practice, press Hide RC,θ(x) each time before you make a New Challenge. Now you have to use the center point and angle θ to figure out where to put x! The activity from which this challenge comes is at http://geometricfunctions.org/links/rotate-family/. When playing this game, students usually begin either by dragging x toward the target (as in the first part of the red trace) or by adopting a somewhat random guess-and-refine strategy. As they try to improve their play, they are encouraged to reason backward, using the target location and angle θ to approximate the required location for x and guide their initial movement. Figure 4 challenges the student to enact the dependent variable of a dilate function: she must drag point y to follow the function rule as independent variable x follows the border of a polygon. Even with hints (the dashed segment and cross-hair showing how close she is, and a traced image of y that changes from red when she’s far away to green when she’s close), this is a real challenge. The player must drag y both in the correct direction and at the correct speed to match the motion of x. In other words, her dragging action must get the rate of change of y relative to x just right. In these activities, students’ use of points as variables creates and gives meaning to a link between physical movement and mathematical variation. The student drags variables on the plane, observing that it is easy to enact an independent variable; she can drag it wherever she wants. It is much harder to enact a dependent variable, constrained by the rule relating it to its independent variable. Your job in this sketch is to be the dependent variable. Independent variable x will move along its restricted domain, and you’ll need to vary y to trace out the range. Practice once or twice by varying y so that the crosshairs stay on the restricted domain. Press Ready...Set...Go and position y so the crosshairs are over x. When x starts moving, begin dragging y to keep pace. Try to keep the traces green. As you improve, increase the difficulty level. You can also go to page 2 for another puzzle. The full version of the activity is at http://geometricfunctions.org/links/functions-dances/. These sensorimotor experiences are enhanced by the close fit between the two-dimensional nature of geometric functions (ℝ2→ℝ2 transformations in the plane) and the two-dimensional input and output interfaces (mouse/stylus/finger and screen) that students employ. Similar activities based on one-dimensional dragging using ℝ→ℝ functions tend to be less compelling both visually and due to the mismatch between one-dimensional variables and a two-dimensional computer interface. In figures 1 and 3 above, the domain of the function is the entire plane, experienced by the student as the ability to drag x anywhere within the window on the computer screen. This is not in the least remarkable to the student, rendering futile any attempt to introduce the terms domain and range at this stage. To develop conceptual understanding, students should have a meaningful reason to restrict a function’s domain and observe its corresponding range. 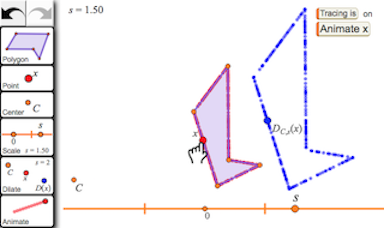 In the Dilate Function activity (figure 5) the student uses the Polygon tool to create a polygon and the Point tool to create independent variable x attached to the border of the polygon. She drags x to explore what happens, and how it feels, when x is restricted to this polygonal domain. After using the Dilate tool to dilate x about center point C by scale factor s, the student turns tracing on and drags x again to observe the corresponding range traced out by the dependent variable DC,s(x). Use the Polygon tool and then use the x tool to attach x to the polygon as a restricted domain. Construct center point C and scale factor s.Where must you drag point s to make the scale factor 0.50? Use the Dilate tool to dilate x, thus constructing dependent variable DC,s(x). Match both glowing objects. What is the relative speed and direction of the two variables? Where can you drag x? Where can you make DC,s(x) go? The full version of the activity is at http://geometricfunctions.org/links/dilate-family/. The act of dragging x on its restricted domain while attending to both the path and the relative rate of change of DC,s(x) are important sensorimotor experiences that provide students with grounding for their conceptual understanding of domain, range, and relative rate of change while also spurring them to consider what it means to apply a function all at once to an entire set of points (a polygon). By the end of Unit 1 (Introducing Geometric Transformations as Functions), students in the pilot test were effectively using the tools and identifying the roles of the various objects. Most were already quite comfortable describing function behavior in terms of relative rate of change (both speed and direction), as illustrated in figure 6. Unit 2 (Connecting Algebra and Geometry Through Functions) explicitly connects the geometric functions of Unit 1 to algebra. It begins by asking students to restrict the domain of these geometric transformations to a number line and to determine which of the “Flatland” (two-dimensional) function families can most easily fit into the “Lineland” (one-dimensional) environment of the number line. (Abbott, 1886) Once students have determined that the dilate and translate families are particularly suitable because their independent and dependent variables always move in the same direction, students engage in construction activities that connect the geometric behavior of dilation and translation to the observed numeric values of their variables on the number line. Construct a number line and restrict independent variable x to the number line. Vary x. How do the values of x and D0,s(x) compare? Double-tap s to check your results for different scale factors. On page 2, investigate translation on the number line. On page 3 combine dilation and translation on the same number line. The full version of the activity is at http://geometricfunctions.org/links/number-the-domain/. 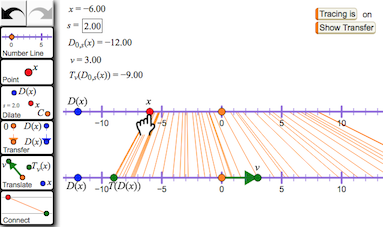 In figure 7 the student uses Number Line, Point, and Dilate tools to create a point restricted to the number line and dilate it about the origin. She measures the coordinates of x and D0,s(x) and drags x to compare the values and describe the relative rate of change numerically. (“When I increase x by 1, D0,s(x) increases by 2 times as much, which is the same as the scale factor s.”) By experimenting with different scale factors, she concludes the coordinates produced by this dilation satisfy D0,s(x) = x·s. She then experiments with translation restricted to the number line and concludes that translation by a vector of directed length v satisfies the equation Tv(x) = x + v. Thus she concludes that dilation on the number line corresponds to multiplication, and translation corresponds to addition. Our student, having moved from Flatland to Lineland and discovered special meanings of dilation and translation on the number line, is now ready for a new task: What happens when you dilate x and then translate the dilated image; in other words, how does Tv(D0,s(x)) behave? (Ideally this is the student’s first experience with linear functions, and she herself will invent the term “linear function” after completing the tasks described below.) Her first effort to enact this task becomes visually confusing, with three variables and a vector stumbling over each other on the same number line. To alleviate the confusion, the next activity incorporates a Transfer tool that moves the dependent variable to a different number line, separate from but aligned with the first. Restrict x to a number line and dilate x to construct D0,s(x). Transfer 0 and D(x) by translating them an equal distance downward. Construct a lower number line aligned with the original. Translate D(x) using a horizontal translation vector v.
Connect the original independent variable x and the final dependent variable T(D(x)), and turn on tracing. Vary x and observe the values of the variables. How can you calculate the location of T(D(x)) from the location of x? Experiment with different scale factors and vectors. Try large and small values, and positive and negative values. The full version of the activity is at http://geometricfunctions.org/links/create-a-dynagraph/. In figure 8 the student has used such a tool to construct a second number line parallel to the original, creating a dynagraph (Goldenberg, Lewis, & O’Keefe, 1992). By varying x and observing the connecting line between the variables, the student describes and explains how changing each parameter (scale factor s and vector v) affects the relative rate of change of the variables and their relative locations. As figure 9 illustrates, students start with the same initial tools that they used to create a dynagraph, but this activity’s Transfer tool rotates a variable to a vertical number line perpendicular to the original (horizontal) number line. 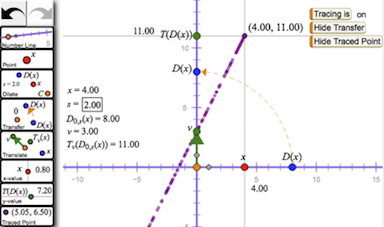 After using this tool to rotate D0,s(x) to the vertical line and translating by vector v, the student uses the x-value and y-value tools to construct lines that keep track of the horizontal location of x and the vertical location of Tv(D0,s(x)). 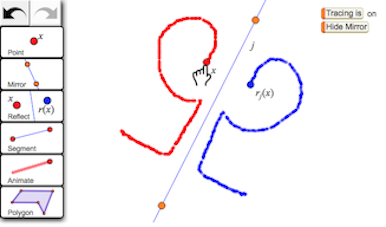 She then constructs a traced point at the intersection of these horizontal and vertical lines and drags x to see how the traced point’s motion corresponds to the behavior of the two variables. Restrict x to a horizontal number line and dilate x to construct D0,s(x). Construct a second number line with the same origin, and drag its gray point to it to make it vertical. Transfer D(x) by rotating it to the vertical number line. Drag the rotated D(x) to put it on the line. Mark the x-value with a vertical line and the value of T(D(x)) with a vertical line. Construct a traced point at the intersection of these lines. Turn on tracing and vary x to observe the values of the variables. How can you calculate the value of T(D(x)) from the value of x? Experiment with different scale factors and vectors, varying x to trace each time. Try large and small values, and positive and negative values. What do you notice? What do you wonder? The full version of the activity is at http://geometricfunctions.org/links/connect-to-cartesian/. After performing the construction, the student tries different values for the scale factor s and the translation vector v, and observes how changing the scale factor affects not only the speed of Tv(D0,s(x)) relative to x, but also the shape of the traced line. 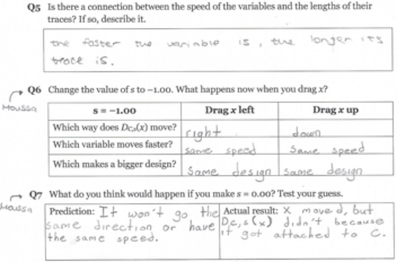 For instance, one of our pilot test students looked at the lower traces shown in figure 10 and explained that the this trace clearly indicated that the variables were moving in opposite directions, because the value of the dependent variable was moving down as the independent variable moved right. She went on to say that Tv(D0,s(x)) was clearly decreasing more slowly than x was increasing, because the traces didn’t go down as quickly as they went to the right. 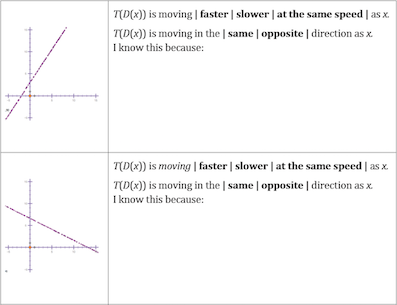 Observations like this suggest that students can indeed use their experiences in geometrically enacting variables and functions to visualize the motion implicit in a static Cartesian graph. Predict where the dependent variable will be if x is dilated about C by the given scale factor s.
Drag y to your predicted location, and then press Check. The solution is shown, your score is updated, and a new challenge appears. Press Reset to start a new round. To change to a more difficult level, press Reset and begin a new round. You cannot change levels once you have started a round. The activity from which this game comes is at http://geometricfunctions.org/links/dilate-family/. The full game has four variants, with a different object missing from each: the dependent variable (shown here), the independent variable, the scale factor, or the center. Figure 12 illustrates the Dynagraph Game, a performance-based assessment for the dynagraph activity described above. In this game independent variable x is always in motion from left to right, and students adjust s and v to control the dynagraph whose dependent variable is T(D(x)). 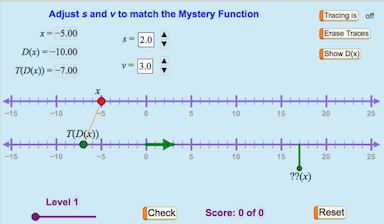 There is also a “mystery function” whose moving dependent variable ?? (x) is shown below the lower axis. The student’s challenge is to adjust s and v to match the mystery function, so that T(D(x)) is exactly aligned with ??(x). Higher levels of the game require greater precision in adjusting s and v.
We conjecture that performance-based assessments such as these can help students solidify their understanding of function concepts while also promoting mathematical fluency, and we are eager to test this conjecture as we continue our effort to refine the activities based on classroom testing. (In this game x is always moving.) Adjust s and v to control the behavior of your function's dependent variable T(D(x)). Your challenge is to match the behavior of the mystery function whose dependent variable is ??(x). When your function matches the mystery function, press Check. Your score is updated, and a new challenge appears. The activity from which this game comes is at http://geometricfunctions.org/links/create-a-dynagraph/. By using web-based dynamic math software and tools tailored to carefully-structured tasks, students can enact geometric transformations as functions, creating them, manipulating them, and experimenting with them. Students can vary the variables, describe their relative rate of change, create and use restricted domains, compose transformations, discover connections between geometry and algebra, and construct and shed light on the Cartesian graph of a linear function, while simultaneously developing a solid understanding of geometric transformations. Our early testing suggests that this approach will enable students to connect geometry and algebra as they ground function and transformation concepts in their sensorimotor experience, and we look forward to further refining the activities and to verifying their effectiveness with a wide variety of students. Abbott, E. A. (1884). Flatland: A romance of many dimensions. San Antonio, TX: Eldritch Press. Carlson, M. & Oehrtman, M. (2005). Key aspects of knowing and learning the concept of function. MAA Research Sampler 9. Washington, DC: Mathematics Association of America. Coxford, A. F., & Usiskin, Z. (1971). Geometry: A transformation approach. Laidlaw Brothers Publishers. Fishman, B., Marx, R. W., Blumenfeld, P., Krajcik, J., & Soloway, E. (2004). Creating a framework for research on systemic technology innovations. The Journal of the Learning Sciences, 13(1), 43-76. Freudenthal, H. (1973). Mathematics as an Educational Task. Springer Science & Business Media. Freudenthal, H. (1986). Didactical phenomenology of mathematical structures. New York: Springer Science & Business Media. Goldenberg, P., Lewis, P., & O’Keefe, J. (1992). Dynamic representation and the development of a process understanding of function. In E. Dubinsky & G. Harel (Eds. ), The concept of function: Aspects of epistemology and pedagogy (pp. 235-260). Washington, DC: Mathematical Association of America. Hazzan, O., & Goldenberg, E. P. (1997). Students' understanding of the notion of function in dynamic geometry environments. International Journal of Computers for Mathematical Learning, 1(3), 263-291. Schoenfeld, A., & Arcavi, A. (1988). On the meaning of variable. The Mathematics Teacher, 81(6),420-427. Steketee, S., & Scher, D. (2011). A Geometric Path to the Concept of Function. Mathematics Teaching in the Middle School, 17(1), 48-55. Steketee, S., & Scher, D. (2012). Using Multiple Representations to Teach Composition of Functions. Mathematics Teacher, 106(4), 260-268. Steketee, S., & Scher, D. (2016). Connecting Functions in Geometry and Algebra. Mathematics Teacher, 109(6), 448-455. Varela, F. J., Thompson, E., & Rosch, E. (1991). The embodied mind: Cognitive science and human experience. Cambridge, MA: M.I.T. Press. Vinner, S. (1983). Concept definition, concept image and the notion of function. International Journal of Mathematical Education in Science and Technology, 14(3), 293-305. Vinner, S., & Dreyfus, T. (1989). Images and definitions for the concept of function. Journal for research in mathematics education, 356-366. Web Sketchpad Copyright © 2015 KCP Technologies, a McGraw-Hill Education Company. 17 July 2016: Most figures now comprise a static completed example and an interactive websketch. 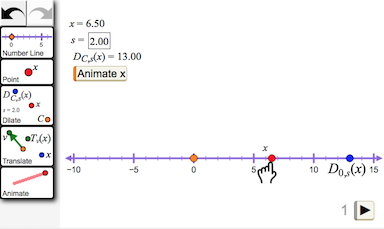 20 July 2016: Figure 3 hint video added, and all interactive figures are now buttons to show their respective websketches. To do: make the figures interactive links just like the "Try it yourself" buttons. To use a tool, tap or drag its icon. Then position each of its glowing objects. Drag a glowing tool object to position it either on an existing object or in empty space. If a tool object has the same label and color as a sketch object, match them by moving the tool object onto the sketch object. As a short cut, tap the desired position for the currently glowing object. Tap the check-mark icon to immediately position all glowing tool objects. Tap the X icon to cancel the active tool. Tap the Undo or Redo icons to undo or redo the most recent tool use.